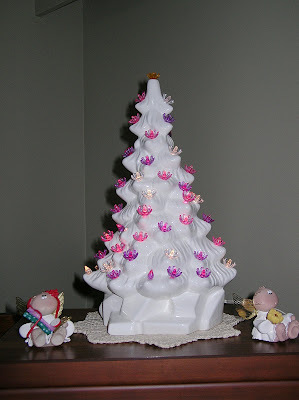 This post is all about the Christmas season at our house. First, is a picture of our tree. This year, I considered not putting up the large tree. 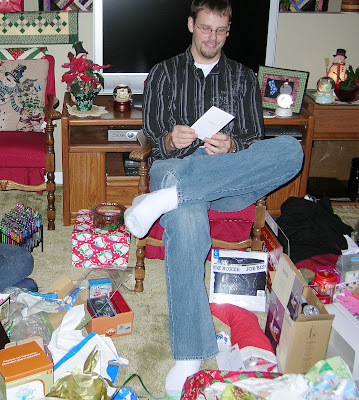 I was feeling overwhelmed with all of the preparations leading up to Christmas, work commitments, etc. 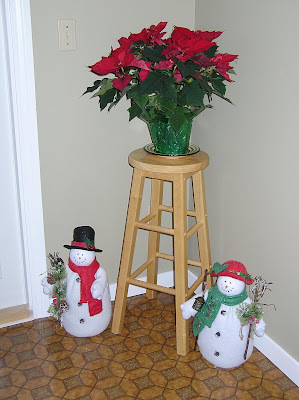 My husband insisted that we needed to have the tree and so while I cleaned the house and rearranged the furniture to make room, my DH put up the tree and with my DD’s assistance, the tree was decorated. This is how handsome our tree looked this year in the corner of the living room. 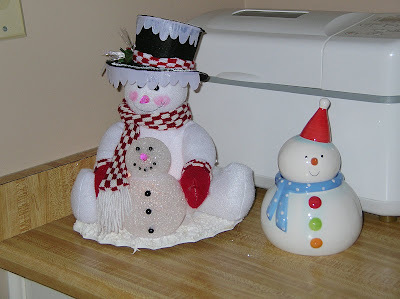 I collect snowmen and these are some images of my favorite snowmen that were displayed in the house this year. My DD not only assisted her father with the decorating of the tree, but she was also responsible for unpacking of the snowmen and other Christmas decorations and setting up the displays throughout the house. 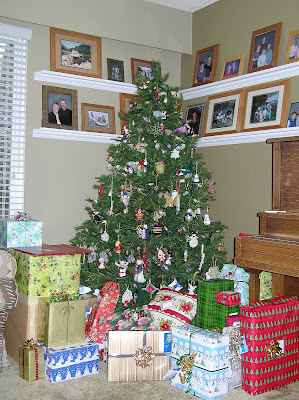 My DD was also responsible for wrapping most of those presents that were under that tree. 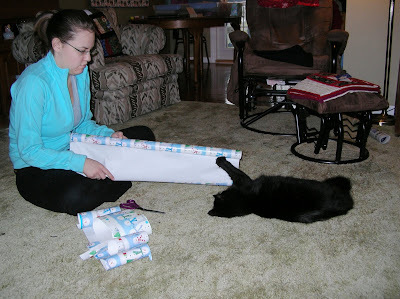 Of course, Joey the helper cat was never too far away! 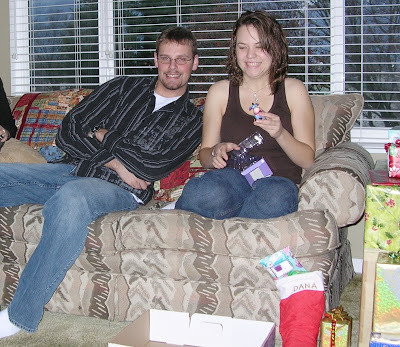 This is a picture of my DS and DD on Christmas morning. They are just starting to open the presents in their stockings. Later, we were joined by my parents. 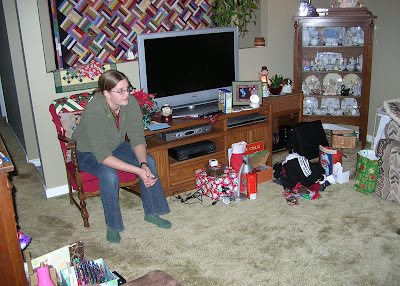 We continued to open presents–just look at that pile of wrapping paper in the center of the room! 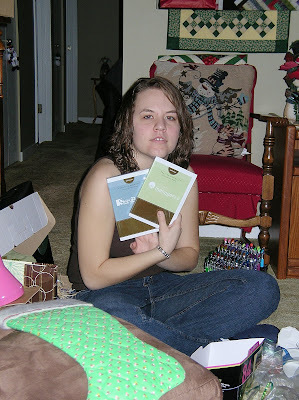 My DD with some computer software that my DH and I gave her. She looks tired, doesn’t she. 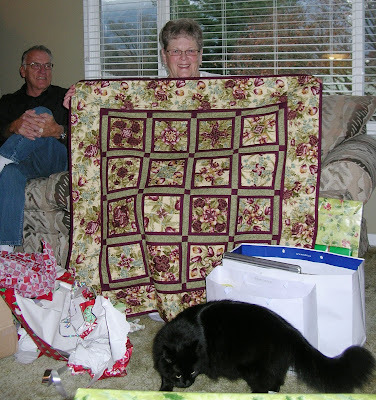 My Mom received some quilts from me. Here she is with one of the table runners that I made for her. 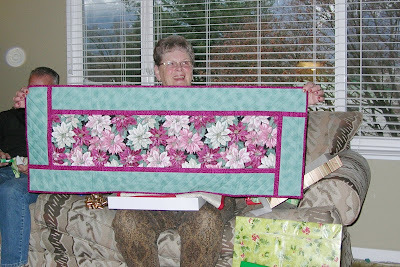 And here is my mother with her latest table topper – the first 4-Patch Stacked Posie Quilt that I made. The quilt collection grows! Note the quilt inspector (Joey) in the foot of the photograph. 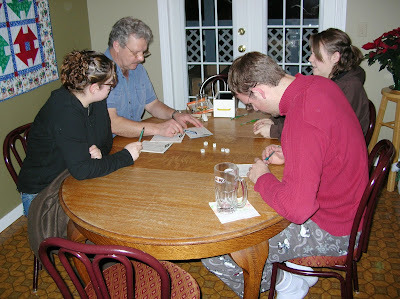 After dinner, my DH played board games with the kids. 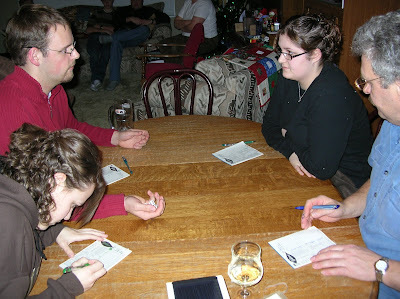 My brother and his family joined us after dinner. 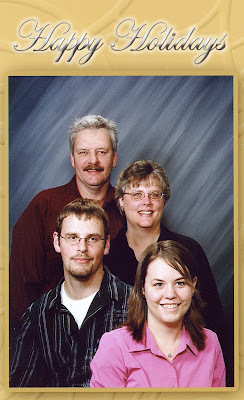 This is my SIL, nephew, brother, mother, and father. Merry Christmas to you and your families from our house to yours! 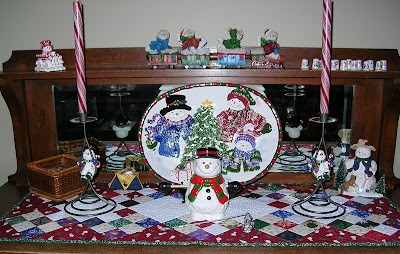 This entry was posted in 4-Patch Stacked Posies, Merry Christmas, table runner by Norma Hanson. Bookmark the permalink. Merry Christmas Norma. What a wonderful time you’ve had with your family. 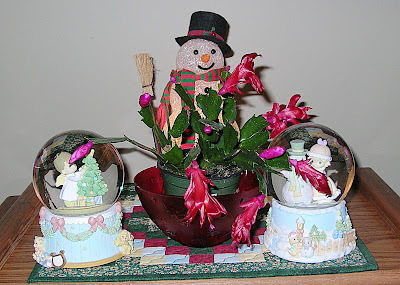 Merry Christmas to you…..thanks for sharing your wonderful day and lovely family. 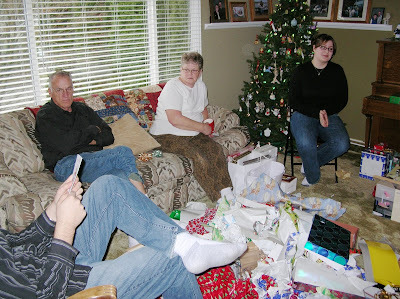 Norma, Looks like a great Christmas was shared by all in your family. Sounds like your DD was most excellent help to you and her dad this holiday season. If that is not where the tree normally sets, then it looks like a good spot for it! 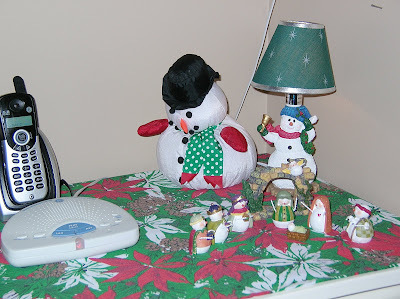 Love seeing all the snowmen pictures–you really have some cute ones in your collection poking out of every nook and cranny of the house. Your mom looks quite happy with both of her quilts—your best supporter, after all. Looks like you all had a marvelous day!! Beautiful decorations! I too, collect snowmen, don’t ‘ya just love them?? Your house looks very beautiful. And it looks like you had a wonderful time with your family. How great that so many of them were able to visit you. What would we do without our daughters? Though this year is the first year in a long time mine hasn’t helped. 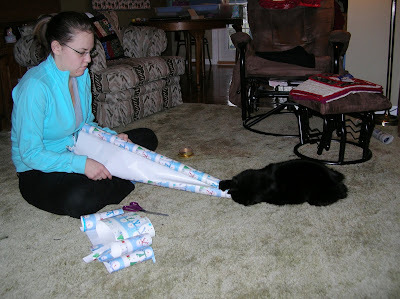 This time Fred helped with the tree – without his help it wouldn’t have happened at our house either. At least it wasn’t quite as tiring because I spread it over several days. What a wonderful day! 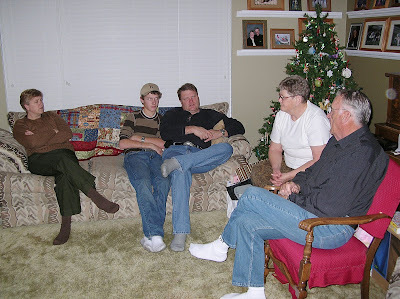 Such fun times and so nice to spend with family! Looks like you all had a wonderful Christmas. Hope your New Year is just as nice! catching up Norma! what a lovely Christmas at your house-very nice to see everyone-a happy new year to you!